South Africa’s citrus industry is looking at strategic actions which could help solve perpetual disruptions and delays at the Port of Durban. Exporters feel many issues in Durban could be resolved by increased breakbulk shipments to China, a market where the industry is experiencing considerable growth at present. In a newsletter issued to growers, the South African Citrus Growers Association (CGA) said containerised exports to China have doubled this season, causing many operational challenges in Durban. “Exports to China require cold treatment, which doubled the requirement for forced air precooling, space as well as specific types of containers. Furthermore it also requires more trucks with Genset units to provide power to the containers during transport,” the CGA explained. The CGA said the added demand for cold treatment shipments caused a backlog in exports, as the supply of container equipment and trucks could not keep up with demand. Despite this, Durban Container Terminals (DCT) has performed reasonably well so far this season compared with previous seasons. Exporters have said delays are much less than previously experienced, although truck congestion at the terminals is still a problem at times. “At this time DCT are functioning better and more productively than seen in the past with some good productivity levels recorded of late,” CGA added. 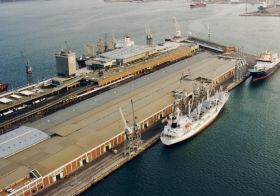 The release said one berth would be decommissioned in the near future, resulting in a displacement of one of the larger vessels that typically berth at the north quay. “On a positive note, there are plans afoot that should see at least 12,000 pallet spaces of capacity being implemented in Durban ahead of the 2019 season,” CGA said. “Of this some 4,000 pallets capacity will be for cold treatment shipments.